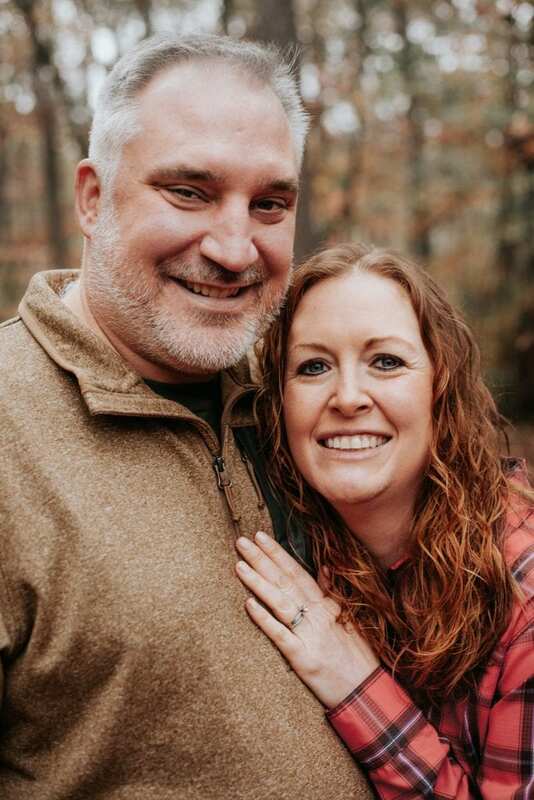 We needed a break from work, so we took a day off and headed to Gaffney, SC to visit National Parks sites #151 and #152: Cowpens National Battlefield and Kings Mountain National Military Park. Both of these sites are Revolutionary War battlefields. I have really been looking forward to visiting both of these sites for a while. I am presently teaching Revolutionary Literature in class, so these visits are very timely for me. Indeed, we just discussed Thomas Paine’s The Crisis No. 1 and used some of the events leading up to these two battles in my discussion. We have visited many battlefields across the US, but these two battles were a bit different. The fields are significantly smaller than most Civil War battlefields we have visited. Normally, we would recommend driving the tour road. 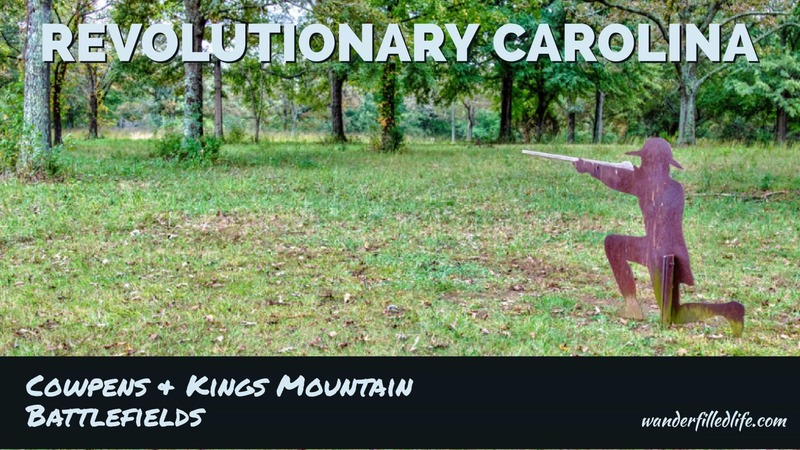 At Cowpens, the road is only three miles long and Kings Mountain does not even have one. In terms of numbers, both battles were relatively small… around 1,000 on each side at Kings Mountain and 2,000 for Cowpens. Most Civil War battlefields we have been to have numbers in the tens of thousands. 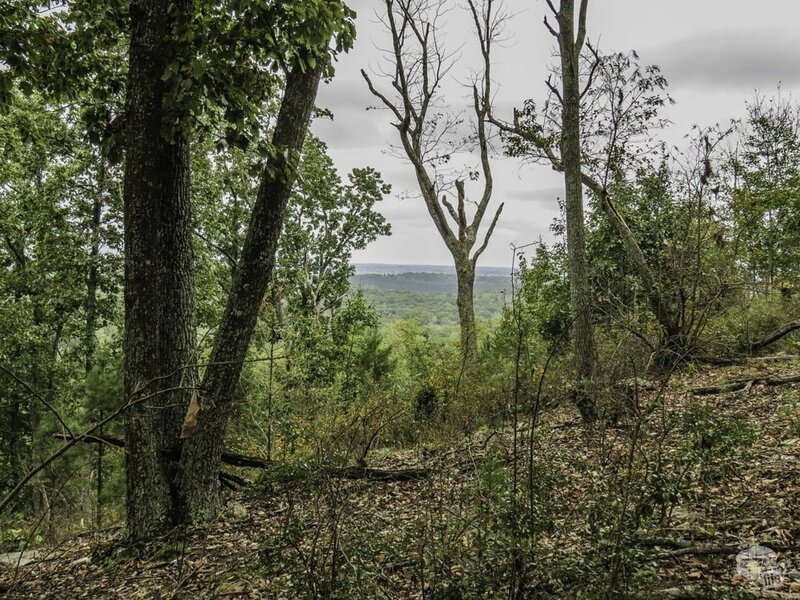 While there were a few cannons at the Battle of Cowpens, this is all you will find on the battlefield… A first for us… An eastern battlefield without a cannon overlooking the field. Both battlefields lacked the staple of nearly every eastern battlefield we have visited thus far: a cannon or two perched upon a hill overlooking the field. Kings Mountain is right off I-85 on the North Carolina/South Carolina border. The entire battle took place on a wooded summit. No open fields. No cavalry charges and no cannons posted on a hill overlooking the battlefield. 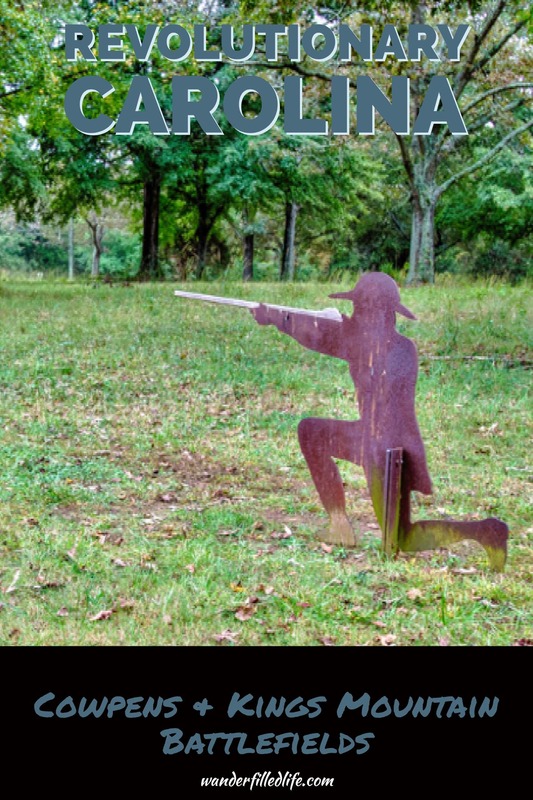 This battle was fought by militia units from both armies, including the Overmountain Men, a group of Scots-Irish frontiersmen who fought for the Colonials. The battle shouldn’t have gone the way it did… The Loyalist militia held the high ground, was better trained and had bayonets against an equal force. Yet, the colonial militia were superior marksmen with better weapons and, ultimately, prevailed. The visitor center has an excellent exhibit and movie which do a great job explaining the battle. 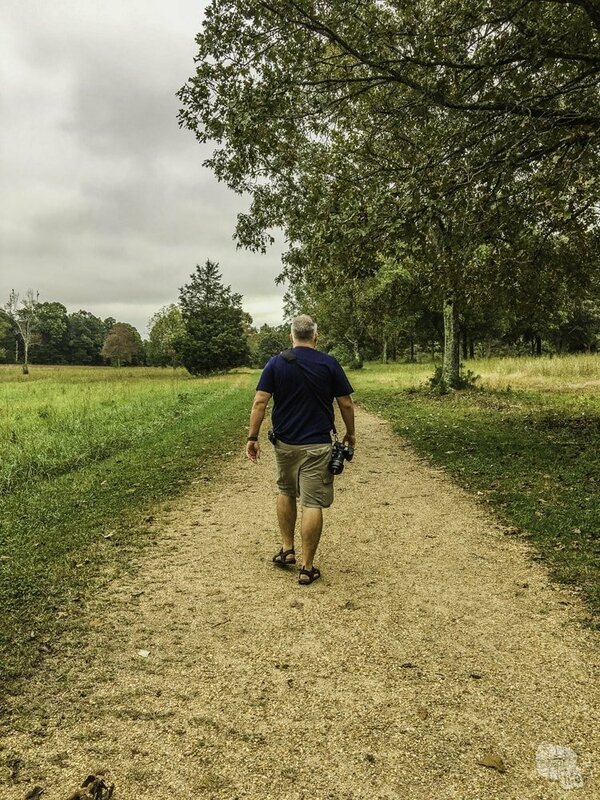 Just outside the visitor center is the battlefield loop trail, a 1.5-mile paved trail through the battlefield. While there are not as many monuments as you will find at most Civil War battlefields, you will still find a few. 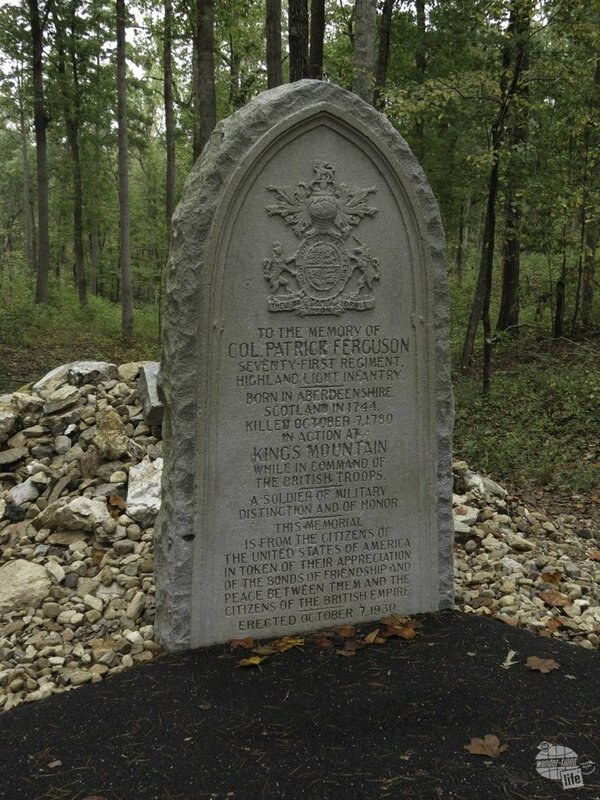 One monument of note is the monument to Col. Patrick Ferguson, the British commander honoring him as a commander. Bonnie hiking on the Brown Mountain trail in Kings Mountain NMP. 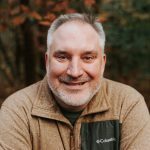 There are also a couple of hiking trails: one to a nearby lake in neighboring Kings Mountain State Park and another to Brown Mountain. We opted to hike to Brown Mountain, which provided a nice escape into the woods, though only a few good views. We really enjoy getting out in the woods on a good hike and this one did not disappoint. The rolling hills and the forested terrain was a peaceful escape. 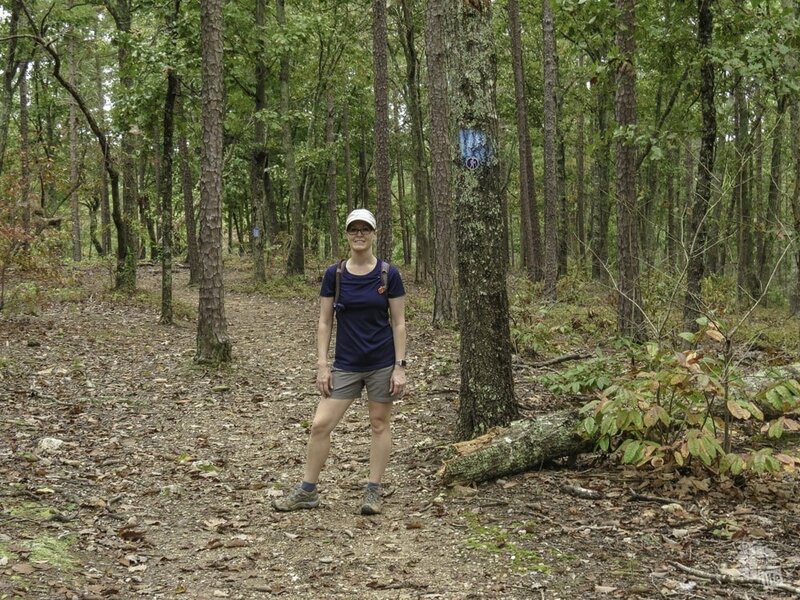 There is a longer 16-mile loop trail which looked interesting but would have taken a full day of hiking. There wasn’t much of a view atop Browns Mountain. An open field historically used by local farmers to graze cattle before taking them to market in Charleston serves as the battlefield. Following the defeat of the loyalist militia at Kings Mountain, the colonial commander laid a trap for the British cavalry commander. Using the militia to lure the British army into fighting range, the Colonials were able to surprise the British and win a significant victory. Grant walking the trail at Cowpens. Grant enjoys getting into the history of the battles and walking the battlefields. 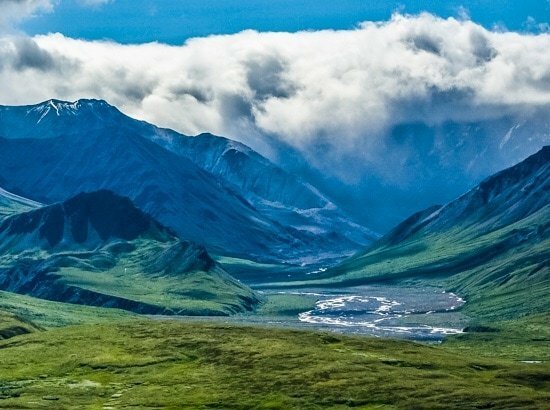 The battlefield has a road circling it but seeing it is much better on foot. Walking the battlefield takes about 30 minutes and allows you to see all the major positions of the battle easily. The visitor center has a good video which explains the battle, but it is only shown at the top of the hour, so plan accordingly. 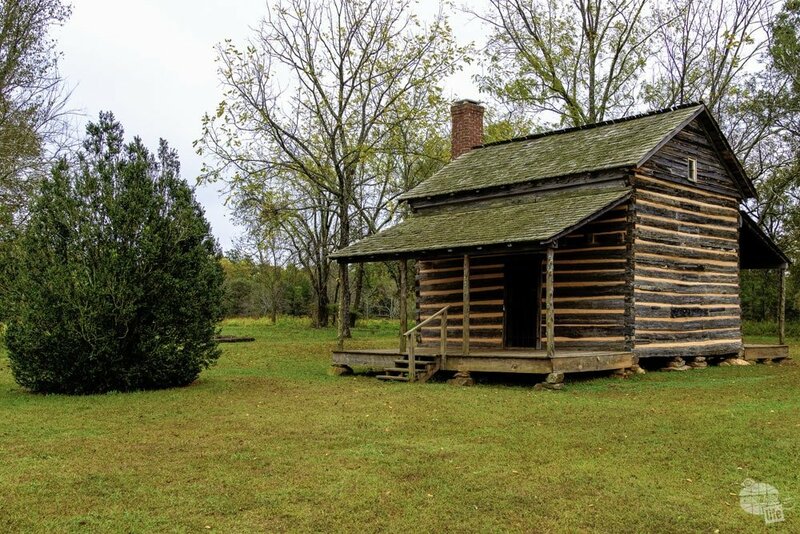 The Scruggs Cabin at Cowpens National Battlefield. 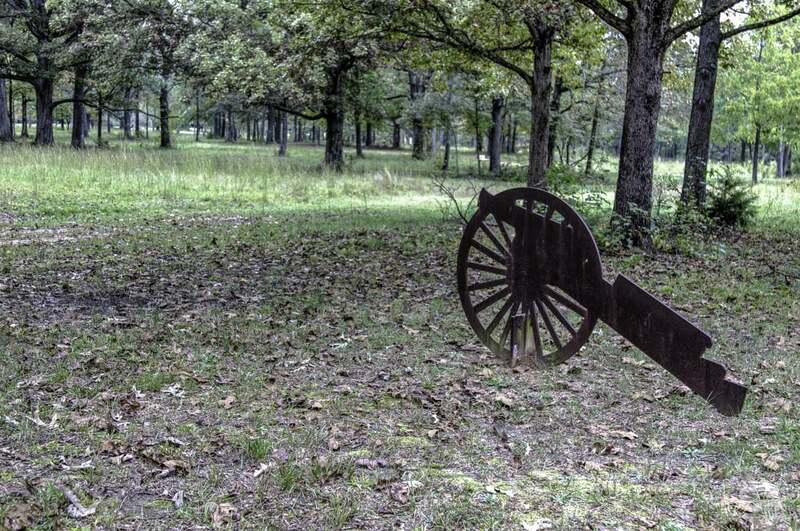 There is also a small cabin at the far end of the battlefield, which served as the unofficial meeting point of the battlefield before the Park Service acquired the site. We were hoping to find a quaint Southern town in Gaffney, but alas, there is not much to get excited about. The downtown has plenty of shops and offices, so isn’t dead, but there is not much reason to spend any time there. 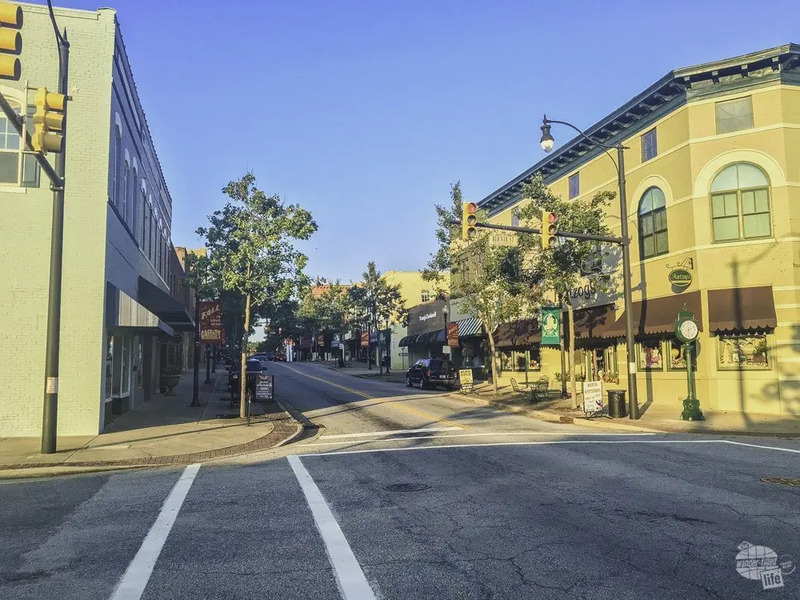 I know we are a bit spoiled by our home, Woodstock, with its great pedestrian-friendly downtown, packed with restaurants and live music. Downtown Gaffney on a Saturday evening. We did manage to find a good barbecue joint, Daddy Joe’s Beach House BBQ & Grill. I am a big fan of all barbecue and I get really excited when I visit different parts of the US so I can try regional flavors. Already the top restaurant in Trip Advisor for the town, Daddy Joe’s did not disappoint. I had a pulled pork plate and Bonnie had the chargrilled chicken platter. The pulled pork was succulent and the restaurant executed the Lexington-style sauce perfectly. The seasoning of the chicken really impressed us. 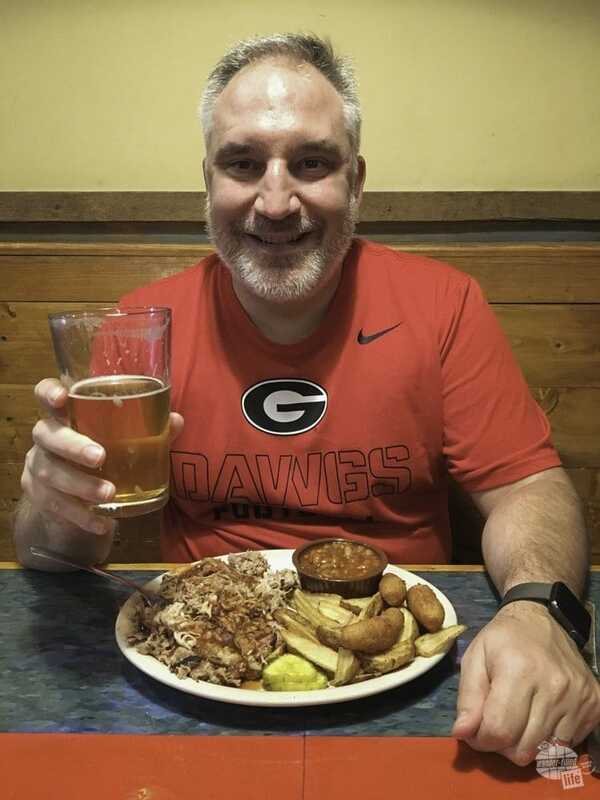 Tasty barbecue and a good RJ Rockers brew… what more could you ask for? We stayed at a pretty good KOA just south of Gaffney. Pine trees shaded the back-in sites. Our site was comfortable, but the cable selection lacked anything in the way of sports channels. We love college football, so that was a bummer. That said, the restrooms were clean, the people were friendly and we would certainly stay here again. In all, this would make a good two night stop just off I-85. You could easily see both battlegrounds in one day and get a serious dose of history. Hello. splendid job. I did not anticipate this. This is a great story.